The first in Steorn’s series of webinars took place today, and it packed a lot of information into its roughly 45 minutes. The headline, though, is that Orbo is (according to CEO Shaun McCarthy) finally going to be offered for sale, in December, with first shipments planned before Christmas. – Next, the Orbo O-Cube was shown and described. It has one USB connection that outputs 2.1 amps, and can be used to charge a phone or tablet. It is composed of three components: the Orbo power pack itself, a lithium ion battery that the power pack constantly trickle charges, and the USB outlet electronics. The battery can be fully drained, but the Orbo power pack will proceed to gradually recharge it. It is expected to produce roughly two full smartphone charges in a 24 hour period. – The O-Cube will go on sale in December, will cost 1200 Euros, is covered by a 12 month warranty, and will only be available directly from Steorn. – Shaun then talked about two companies that are early adopters of the Orbo technology: a guerrilla marketing firm called RabbitHole (of which Steorn is a client), and an Irish clothing company with a name that sounds something like “Brick Baron”. – Next Shaun talked about a third early adopter company, and showed another prepared video in which a representative of that company speaks. The company is Liquid Solutions, and they produce e-cigarettes and related “Wicked” e-juice products. Shaun later states that Liquid Solutions is expected to bring the first licensed Orbo product to market, an e-cigarette that does not need recharging, in about six months. – The next planned webinar will discuss other types of products that Steorn plans to embed the Orbo in. No date was given for the follow up. – Shaun acknowledges that 1200 Euros is expensive, and explains that this initial O-Cube device is not aimed at a mass market, that most people would not be able to afford it or be interested in it, but those that do buy it will be getting a piece of history. – No, the Orbo is not an energy harvesting device. it can be run in a Faraday cage, or a calorimeter, and it can be shown that it is producing more energy than it receives from the environment. They have precluded all forms of kinetic charging and classic energy conversion. – The O-Cube has no moving parts; it is fully solid state. If a part moves, it’s because you broke it. – The device can be taken apart, and the Lithium battery can be replaced. This is important because batteries have a limited number of charge cycles. The Orbo powerpack itself is sealed, and if opened, the warranty will be voided. – In response to being asked what the energy ratio of the device is, Shaun responds that this is not an appropriate way to think about it (meaning, I expect, that it takes no energy in and so its output cannot be expressed in terms of a ratio). The Orbo powerpack produces a constant 0.4 watts that is used to trickle charge the lithium ion battery. 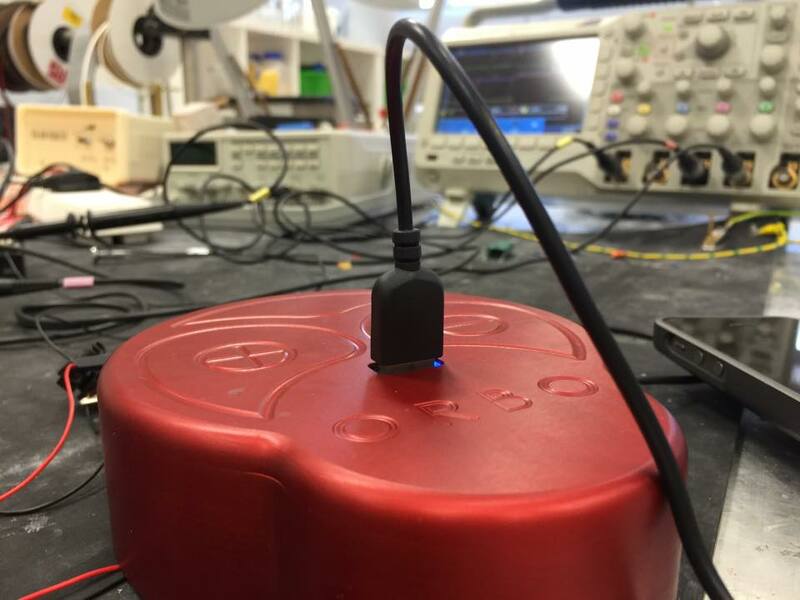 – When asked about the estimated lifespan of the product, Shaun states that they’ve had Orbo batteries under constant load for approximately two years, with absolutely no degradation. The lifespan of the product itself will be determined by the lifespan of the battery and electronics, which can be replaced. – Asked about Orbo’s potential for generating kilowatts of electricity, Shaun says “we don’t see a lot of opportunity at the larger scale”, and goes on to state that others are working on this problem, and good luck to them, but Steorn’s focus has always been on mobile consumer electronics. I interpret this to mean that they have not succeeded in scaling up the effect substantially in a practical way. – Multiple units can be daisy-chained to increase power output. – The weight of the O-Cube is roughly 0.3 kg. A lot of that weight is in the case, which is made of heavy aluminium. – There will be no volume discounts. – Steorn will not be making a lot of profit per device. The one piece of this story that I can independently verify is that the e-cigarette company that produces “Wicked e-juice” has been promoting an Orbo based e-cigarette for some time. An alert reader pointed me to a page on their site back in November 2014, that advertised an e-cig pen “without the need to recharge”, that is “powered by Orboost”. That page has since been taken down, but is available on archive.org here. 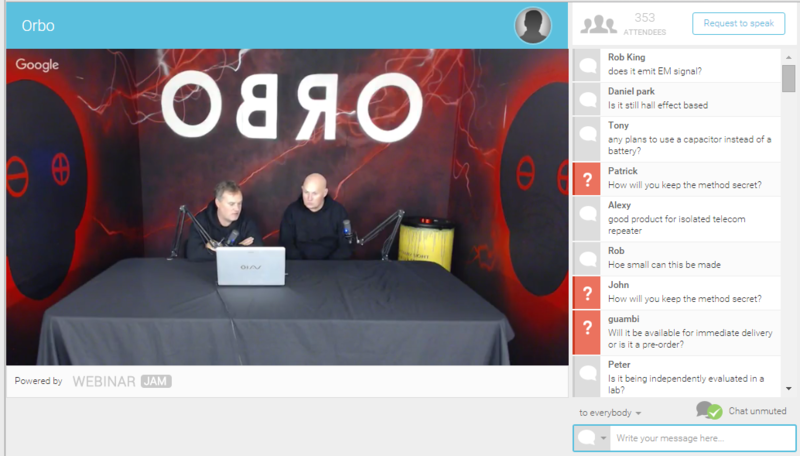 On the one hand this shows that the e-cigarette company introduced in the webinar, and its interest in Orbo technology, is real. On the other hand it demonstrates that Shaun is a liar, but it could be said this was a justifiable fib in defense of company secrecy. 2) Accept paid O-Cube orders but never deliver O-Cubes. At that point they would be guilty of outright fraud. 3) Accept paid O-Cube orders and deliver O-Cubes that don’t work as stated. Again, this would make them guilty of fraud. 4) Accept paid O-Cube orders and deliver working O-Cubes. This would be the unlikely beginnings of an enormous scientific and technological revolution. Still at this late date, there are good reasons to support very different interpretations of Steorn’s actions. If this were not an “impossible” product they’re promising, it would seem like a run of the mill marketing effort by a small amateur start-up: confident users and investors, a quick demo, and a call for action. 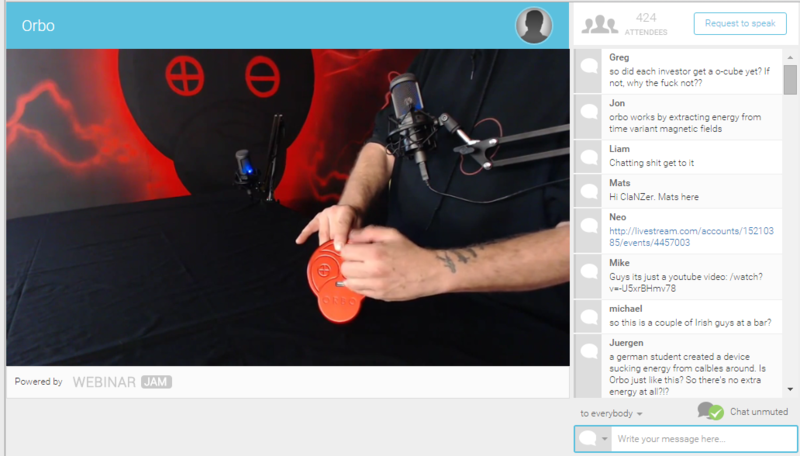 The webinar could easily have fit in on Kickstarter. But it is “impossible”, or at least it flies in the face of an enormous amount of basic scientific knowledge. On top of this is Steorn’s long history of delays and misleading statements, and the oddly small scale and eccentric nature of Orbo’s supposed early adopters. A clothing company? A small time e-cigarette company with a shoddy web presence? Steorn’s own marketing firm? This is not how I would imaging an unparalleled energy revolution would begin. But then again, this hasn’t been done before. In any event, all speculation will hopefully be moot in short order. Not just when the eternal “soon” arrives, this time, but (according to Shaun anyway), in at most two months. The full webinar video can be found here.